In the early days of blenders, my mother filled her “Osterizer Container” with cabbage, carrots, and onions suspended in water. 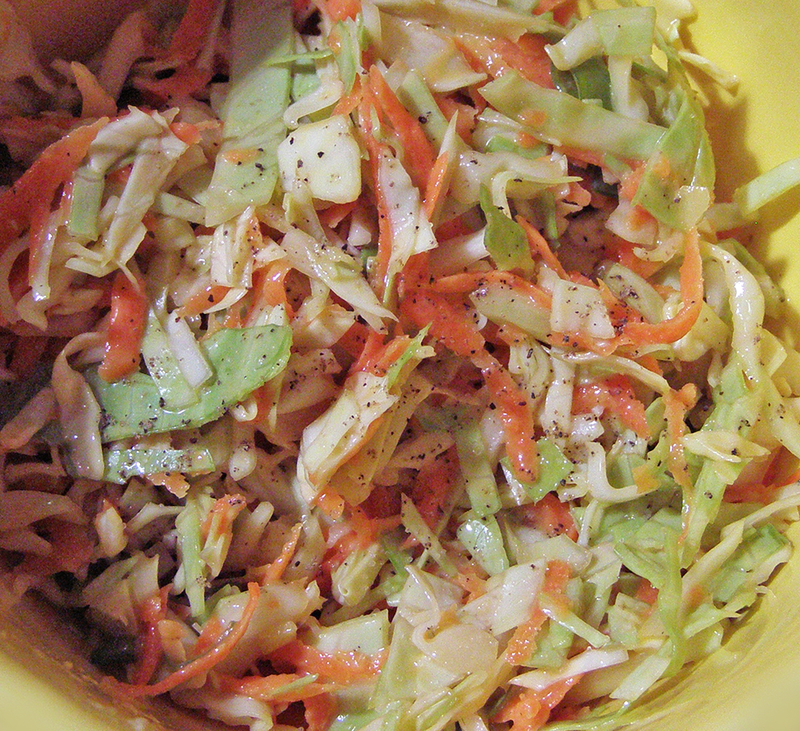 She pulsed each veggie into shreds, drained off the water, then mixed them all with mayonnaise, cider vinegar, salt, and pepper to make coleslaw. I did this a few times too, till I noticed that the green and orange water looked too nutrient-rich to waste. And so it was back to chopping and shredding, which I like because it’s quieter, and more eco-friendly. This recipe changes after the first day, the onions get stronger and add a kick similar to horseradish. If you don’t want to experience this, mix onion into only the portion that you and yours plan to eat immediately. The same goes for the celery seeds. They get stronger the next day, so if you’ll have leftover slaw, sprinkle them on at the table. I use grey salt in this recipe, which is hand-harvested sea salt that is less refined and higher in trace elements than regular sea salt. Its flavor is more complex, and IMO delicious. The crystals are coarse, so it needs to be dissolved in a liquid before using. ¾ large head of cabbage, about 1 ½ lbs. Shred or chop cabbage into small pieces. Trim and shred carrots. Chop green onions into 1/8 inch slices. Mix vegetables together in large salad bowl. Stir mayonnaise until smooth. Dissolve grey salt in vinegar and beat into mayonnaise a little at a time. Add pepper, and celery seeds if desired. Pour the dressing over the salad, toss and serve at once.